I just saw the great Sparkle video on Channel9. On of the most funny part was the question 'What is an Architect?'. The anwer from John Gossman was 'It is a fancy title for a programmer' or in other words 'You are old'. I hope you enjoy the movie, I did. I can't wait to play with it. The slides from my presentation 'NDoc Integratie in Visual Studio 2003 & 2005' can now be downloaded. Many years ago I programmed in Smalltalk (Enfin which later became ObjectStudio). 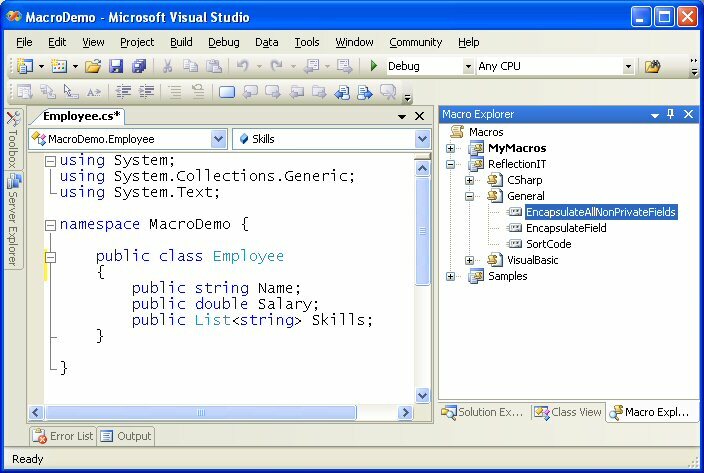 I have always liked it although it was not very programmer friendly (no IntelliSense). I have just wachted this C# 3.0 Language Enhancements in action video. The shown Extension Methods feature realy looks like the Secondary Class files of Smalltalk. Nice to see them back, they where very handy. In the following example I have added the 'IsPrime()' method to the 'Int32' type. The 'this' keyword in front of the 'number' parameter of the IsPrime() method did the real trick. This makes it an Extension Method. I will be speaking at the SDN Software Developer Event on the September 16 2005, De Reehorst - Ede . I will talk about the integration of NDoc with Visual Basic 2003 and 2005. Hope to see you there.